Paolo Caliari, called Veronese because he was born in Verona, was famous for his large, crowded, and colorful paintings, which decorated the palaces and churches of Venice. 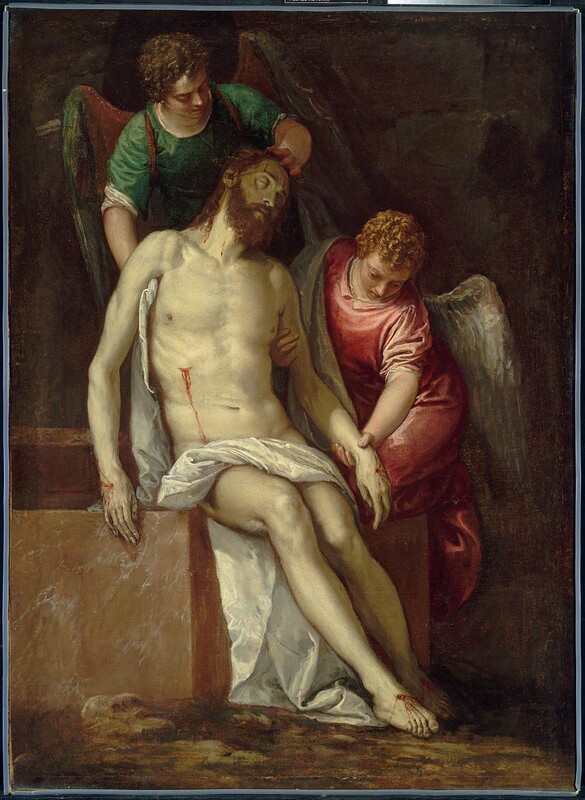 Veronese focused here, however, on the harsh physical reality of death. Cold light intensifies the pallor of Christ’s skin, poignantly contrasted with the warm, rosy hand of the angel who clasps his wrist. The intimate scale and meditative mood of this somber devotional image occur only in the artist’s late work. This may be the painting, said to have been acquired from Pozzi and sold to Mr. Owen, that is included in the inventory of Teodoro Lechi. See Fausto Lechi, ed., "I Quadri delle Collezioni Lechi in Brescia: Storia e Documenti" (Florence, 1968), p. 186, inv. no. 120. A letter from Ellis Waterhouse, Oxford, to Lucretia H. Giese of the MFA (February 14, 1979) suggests that "Mr. Owen" may be T. B. Bulkely-Owen.